The Burlington Hotel offers 500 bedrooms and conference facilities for up to 1,300 delegates in close proximity to the city centre. The Burlo, as it is known among Dubliners, is the venue of choice for gala events in central Dublin and offers stylish accommodation. The Burlington is located on Upper Leeson Street, just South of the picturesque Grand Canal. You can walk from the hotel to St. Stephen’s Green in 15 minutes. The Burlington is very convenient for offices located in the South inner city between Grand Canal Dock and Harcourt Street. Standard doubles start at €109.00 per room per night, excluding breakfast. 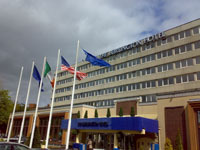 Executive rooms are available from €129.00 per room per night. Executive room rates include free continental breakfast, express checkout and access to the executive gym and lounge. The Burlington offers discounts up to 40% for long term stays and often has special offers for last minute bookings. The Burlington hotel offers 18 meeting rooms for groups of 5 to 800 delegates. Room configuration and seating are very flexible and allow you to tailor the size to the type of event you are planning and the number of attendants you are expecting. The Burlington’s elegant Ballroom can accommodate up to 1,200 guests. You can also hire the hotel’s entire ground floor, which will provide ample space for 1,300 delegates. Room hire starts at €550.00 per day. The Ballroom is available for €10,000 per day. Other rates available on request. All bedrooms have complimentary high speed Internet access. Free WiFi Internet access is available throughout the public rooms and all conference facilities. The Burlington further offers executive guests a private 6th floor lounge with views over Dublin’s South inner city and a gym, also located on the 6th floor. The Burlington features two restaurants and two separate bars. The resident’s bar at the Burlington stays open until 2:00. Travelling from Dublin Airport, a taxi ride will take approximately 45 minutes, pending traffic, and cost €30.00. The Aircoach bus service to and from Dublin Airport stops across the road from the Burlington on the corner of Upper Leeson Street and Appian Way. A single journey on the Aircoach costs €8.00. A taxi to and from a city centre location will cost approximately €8.00 to €12.00. Bus routes 11/11A and 46/46A to Stillorgan stop close to the Burlington.